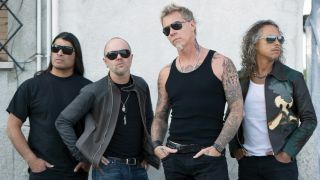 Listen to new Metallica track Atlas, Rise! Metallica have released a video and stream of their new track Atlas, Rise!. They previously issued a teaser clip of the song on their website, and it’s the latest track to be previewed from their upcoming 10th album Hardwired… To Self-Destruct. It’s out on November 18 on 2CDs along with a deluxe edition featuring a third disc. The video for Atlas, Rise! can be viewed below. Metallica say: “Less than three weeks now until all 12 new tracks from Hardwired…To Self-Destructare cut loose for good and today we’re proud to bring you the third and final sneak peek from the album, Atlas, Rise! “Hopefully, you will hear it on your local radio station and check out the video by Clark Eddy, our master editor and the unsung hero of the making-of-the-album “behind the scenes” clips that have graced Metallica.com and Mission Metallica over the years. “It’s been a crazy, exciting, hectic, insane wild ride since we unleashed the first song and title track to the album on August 18 and if you have somehow managed to avoid us since then, Hardwired…To Self-Destruct hits the streets on November 18, 2016. “The album was produced by Greg Fidelman, along with James and Lars, and is available for pre-order in a variety of configurations including 12 songs on a double CD, vinyl, digital download, as well as a deluxe version including cover songs and live tracks. Metallica previously released Hardwired and Moth Into Flame from the follow-up to 2008’s Death Magnetic. Metallica released a limited edition Hardwired… To Self-Destruct Halloween mask late last week, which gave fans the chance to hear Atlas, Rise! 30 minutes before its official launch. Metallica have also added a date to their Hardwired tour dates. They’ll play Singapore’s Indoor Stadium on January 22. The band’s next live show is on November 1 at Bogota’s Hipodromo de los Andes, in Colombia.